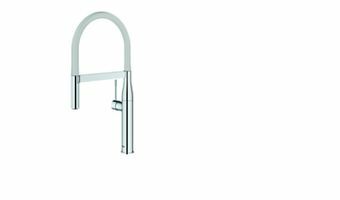 ORLANDO, Fla. (Jan. 10, 2017) ― GROHE, the world’s leading single-branded manufacturer and supplier of kitchen and bath fittings, returns to the KBIS show floor with an assortment of solutions for the kitchen and bath. Leading with the brand’s newest introductions, Concetto Semi-Pro and Essence Semi-Pro kitchen faucets in a selection of hoses in neutral colors, GROHE will be showcasing a unique variety of products designed to meet the needs of today’s homeowners and trade professionals. Presented as part of the LIXIL Americas portfolio, the solutions will be found in Booth #W1547, West Hall at the Orange County Convention Center, January 10-12, 2017. Kitchen Faucets that Make a Splash - Coming Soon! The high-quality offerings are also high on performance: the faucets operate with a 360-degree turnable spring for a fully rotating spray arm, and feature a powerful magnet to guarantee seamless docking after use. While both faucets are cosmopolitan in their design aesthetic, each is distinct in its GROHE Design DNA. Concetto showcases pure geometric intersections infused with subtle angles that make a strong professional statement in the kitchen. Essence was designed for the most demanding European aesthetics and is based on pure concentric geometry; the strong base of Essence meets the hose with a more sinuous, fluid silhouette. Concetto Semi-Pro is listed at $499 MSRP, and Essence Semi-Pro is listed at $699 MSRP. The GROHE Concetto faucet collection also has a line for the bath, and the newest additions are both super-slick in design and thoughtful in functionality. 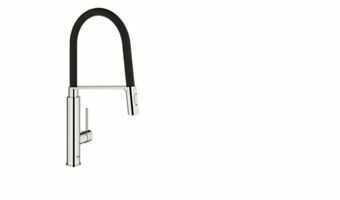 The newcomers include the Concetto XS Single Hole Faucet and Concetto Wideset Three-Hole Faucet, which were developed to meet the American Disabilities Act (ADA) requirements as the lever is no more than 6 inches high when in use. The levers’ 6-inch adherence means that an individual seated in a wheelchair can activate the faucet within a comfortable range. A third look comes via the Concetto L-Size Single Hole Faucet, which continues the line’s contemporary design and while taller in height, still meets ADA requirements for other types of applications. Featuring GROHE’s SilkMove cartridge, the Concetto faucets can be operated with smooth handling for effortless precision. The faucets are both WaterSense and CEC certified to meet the most stringent water conservation needs of 1.2 gallons per minute to offer the user high performance without sacrificing on style. 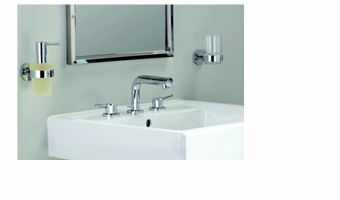 Concetto bath faucets start at $209 MSRP. Other additions to this popular collection include new Tub/Shower Trim that have clear red and blue markings for hot and cold as well as a concealed mounting for a simple and clean look. Along with the Tub/Shower Trim, the collection also includes a new easy to install tub spout (“slip fit,” which slips over the pipe protruding from the wall) available at an affordable price point. The trim is available for all standard Grohsafe pressure balance valves as well as the pressure balance valve with built-in diverter. Lastly, completing the new Concetto additions are the new 2-Way & 3-Way Diverters and Trims that are designed to meet national and regional water conserving requirements. 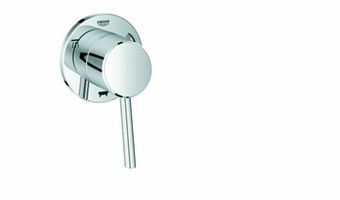 The diverter valves are available with options for dual-use (the user can operate the handshower and showerhead simultaneously) or for mono-use (the handshower and showerhead use is set to one outlet at a time). The mono-use diverter valve is CEC certified and available for purchase in California. The Concetto trims are user friendly, as they are marked with the appropriate icons to match the shower application. Concetto Tub/Shower Trim start at $135 MSRP, Concetto 2-Way Diverter and Trim start at $99 MSRP, and Concetto 3-Way Diverter and Trim start at $119 MSRP. 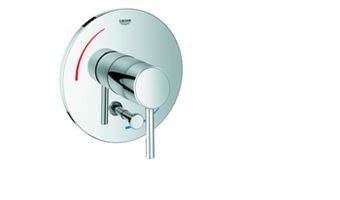 To learn more or find a retailer near you, visit www.grohe.com/us. Learn more at grohe.com/us, or follow us at facebook.com/groheUS, twitter.com/grohe_US, youtube.com/user/GroheAmerica, instagram.com/grohe_us/. StarLight®, GROHE SpeedClean®, GROHE DreamSpray®, GROHE Euphoria Cube® and GROHE Tempesta® are registered trademarks of GROHE AG.